Watch enough movies and eventually you’ll realize you’re the target audience for certain genres and tropes that work on you even if they don’t most others. No this isn’t a "Suicide Squad" review, and no, I’m not the target audience for that film. I’ll try to be fair and honest here, but I’ll be the first to admit that I’m a sucker for the type of film Emily Ting set out to make here. It’s her directorial debut, and it likely suffers from some first time director woes, but make no mistake there is a niche audience that not only enjoys this kind of film but “gets” what Ting was trying to do on a level others may not. It begins with the meet cute as Ruby (Jamie Chung), having lost her way, asks Josh (Bryan Greenberg) for directions. He just happened to have gone for a smoke break to get away from a rowdy birthday party. He’s convinced no one will notice his absence. Considering she’s navigationally challenged, this being her first time in Hong Kong, and he’s happy to get away from his “friends” for a while, he offers to guide her to her destination. Along the way they tell each other a bit about themselves and form a quick rapport after discussing the US cities they left, and the jobs they’re doing versus the jobs they wish they were doing. Like in "Lost in Translation" (one of the likely inspirations), Ruby and Josh are people who form a bond out of their similar need for familiarity in a foreign land. Yet that need isn’t nearly as well established as it should have been here. From there the two visit a handful of notable sightseeing destinations. From Bank of China to the outdoor mid-level escalators to the avenue of the stars to Chungking Mansion, this film plays like a tourist’s vacation guide. This sort of travelogue, walk and talk romance has been done many times before, and setting itself apart is the biggest hurdle the film faces. The most obvious inspiration is Richard Linklater’s "Before Sunrise," and Ting pays homage to it with a scene involving a fortune teller (as did Chris Evans’ very similar directorial debut “Before We Go”). Where Linklater’s film offers characters bonding on an intellectual level, Ting’s bond on a cultural one. But neither of the leads, Jamie Chung and Bryan Greenberg, are as charismatic and memorable as Ethan Hawke and Julie Delpy. They’re not even as memorable as Owen Wilson and Marion Cotillard in Woody Allen’s "Midnight in Paris," though that film does a lot of other things to set itself apart. Chung, for her part, fares better than Greenberg, but neither quite posses the charisma to carry such a dialogue heavy film. Don’t get me wrong, they’re charming enough, but they don’t always sell these occasionally contrived situations and lines of dialogue. Though I hesitate to say it’s entirely their fault for fading into the foreground while being cast against what I consider to be the most cinematic city in the world. And that’s one of the reasons I’m in the target audience for this film. I won’t be “that guy” who says “the city becomes a character in the film,” because we’ve heard that line enough times for it to become a joke in David Wain’s 2014 parody film “They Came Together.” Nevertheless, the city itself is central to what Ting was trying to do here. It’s a place where East meets West. A place of great beauty and cultural diversity. A big little world. A large population densely packed into a relatively small amount of land (which makes the sightseeing tour they go on possible over the course of only a night or two). It’s also a place where western expats are increasingly common. In fact, the characters take note of the fact that years ago Asians immigrated to America and now Americans seems to be heading East. There are enough Chinese Americans and Americans in Asia who will identify with these characters and their discussions on Asian culture and expatriatism to justify this film’s existence. To a large degree “Already Tomorrow” does similar things to "Shanghai Calling" - a film involving a Chinese American man getting relocated to Shanghai where he falls for a caucasian American expat who helps him adjust to life in China. Both films devote brief scenes to discussion of cultural differences and show characters facing varying degrees of culture shock. There are brief discussions about interracial dating. And both have a bit of fun with the cultural expectations considering the Chinese American doesn’t speak the native language, but the caucasian expat does. At one point Josh even refers to himself as a “gweilo” without explaining the meaning. There are a handful of these sorts of “in jokes/conversations” in both films, and they’re satisfying if only for the fact that they’re not represented in mainstream media very often. But where “Shanghai Calling” tried to do too much narratively and failed as a result, “Already Tomorrow” does a tad too little. And at just an hour and eighteen minutes in length, many viewers might feel cheated by the film’s abrupt and noncommittal ending. 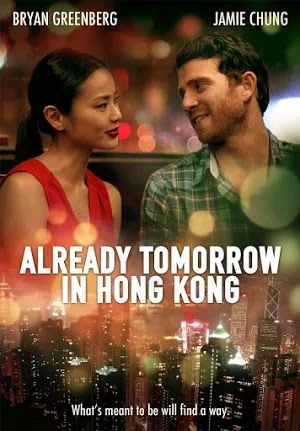 It’s more confident about what it wants to be than “Shanghai Calling,” but ends up feeling just as much an imitation as “Before We Go.” Yet “Already Tomorrow” does enough right to be worth the effort. It even manages to make you root for these two, even if it doesn’t do as much as it should to prove why they’d even consider leaving the ones their with for each other. If you only come to this one for the chance to see another film inspired by the films you like, stay for the cultural discussions and spectacular views of Hong Kong and it’s illuminated nighttime cityscapes. Let’s just say you could do far worse if you’re scanning Netflix for your evening entertainment.